OK, enough of that. The point is, Rehoboam ignores the pleas of his people. But don’t blame him for it – he doesn’t have free will. His behavior is being manipulated by Yahweh again, to fulfill prophesy in chapter 11 that he will lose the throne. And sure enough, pretty soon one of Rehoboam’s slave masters is assassinated, Rehoboam flees to Jerusalem, and Jeroboam installs himself as king over all but Judah. Then Rehoboam creates an army of 180,000 from the tribes of Judah and Benjamin. (Aha! So two tribes remain loyal – maybe that accounts for the bad math in chapter 11.) And they set out to quell the rebellion, but turn back at the last minute because god whispers to a prophet that they should not fight the Israelites. Does this seem even remotely plausible to anyone???? Gets better. 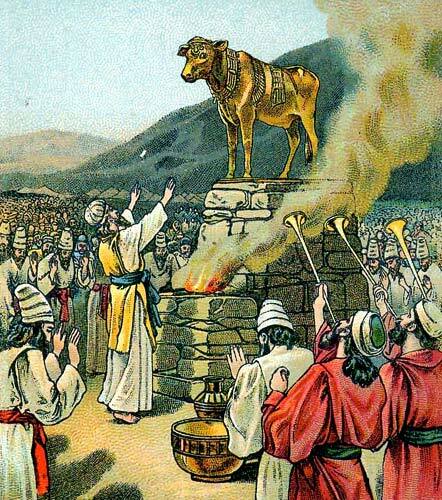 Now Jeroboam turns from Yahweh and makes golden calves for the people to worship, just like Aaron did way back when. Here we go again. Exactly what is the point of that? And why would an all-knowing god go to all the trouble of taking the throne from Solomon’s family only to give it to another loser? The story of the disobedient prophet is both disturbing and confusing. This ‘man of god’ comes to chastise Jeroboam, to prophesy about burning bones and destroying the unauthorized altar. But after fulfilling his errand, the prophet is double-crossed by a second prophet who tricks the first into breaking one of the god’s stipulations about food and drink. What the heck, are we back to Spy vs Spy? Good cop, bad cop? 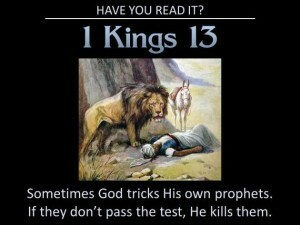 So the one prophet curses the other prophet, who ends up getting eaten by lions because it is the will of god. Then the second prophet feels guilty, goes and retrieves the body, and requests that when he dies his bones be buried with the other guy’s bones. And I think this is supposed to fulfill the original prophesy about the burning bones? And make Jeroboam turn from his evil ways? (If so, it doesn’t work.) But honestly, I can hardly make head nor tail of it. And Jeroboam goes on to commit the further sin of appointing anyone who applies to the priesthood – sort of like some online universities that grant questionable degrees. There’s a long explanation about the prophesy thing in the SAB – basically saying it wasn’t prophesy at all, since it can be proven that the book of Kings was written after the so-called prophesy took place. Haha. 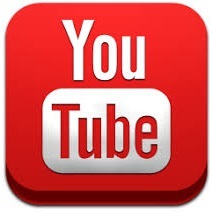 Even more disturbing – is Yahweh orchestrating all this twisted behavior? Why does he allow Jeroboam to get away with all this idolatry and then allow a man to be killed for the crime of snacking? But apologist websites are all over the story – they use it to drill the importance of obedience. Disgusting! Jeroboam finally get his just deserts. A prophet passes along a message that god will punish him because he wasn’t good like David was (!!! ); that disaster will reign upon his dynasty and upon every descendant, slave and free alike (back to punishing the innocent); that his family will be eaten by dogs and vultures. They all die. Meanwhile, back in Jerusalem, Rehoboam is still king of Judah. And the behavior there isn’t any better. Do these crazy Israelites never learn? They have pagan shrines, Asherah poles, and ‘sodomites’ committing ‘abominations’ (v 24 KJV). This verse is translated in modern bibles as “male and female shrine prostitutes” (NLT) or “male shrine prostitutes” (NIV) or “male cultic prostitutes” (NET). You can see the bias of the translators here in their interpretation of what is considered ‘abominable’. And Rehoboam’s fate is no better than Jeroboam’s, either. He loses a battle to Egypt and all of Solomon’s treasures are raided. Rehoboam later replaces them – in bronze. Gold to bronze in a single generation about says it all. And Rehoboam dies an ignominious death.